Develop an appreciation for curiosity and investigation while reducing visitor fatigue syndrome. The design purpose for Miami’s new Frost Science Museum as described in Fast Company’s ezine was touted as having a deeper mission than just being Instagrammable to draw in crowds. Being mission-driven is critical for us at EID, so I was intrigued. In the article museum president, Frank Steslow, had some interesting takes on the concept of visitor experiences that the architects were directed to accomplish. He pointed out that, "An overall experience is set by a series of individual experiences, and those all need to be different for someone to walk away fulfilled. It’s a challenge for designers to create peaks and valleys for emotional experiences. Some are big ‘gotchas’ and some are subtle. So it’s about hitting a sweet spot of quiet, contemplative experiences and loud, engaging, high-energy experiences." The article also reports on one key element that came out of an initial community workshop where participants commonly expressed a desire to be outside. The architects came up with a village approach reflecting a campus-like series of indoor/outdoor facilities. These outdoor areas offer a respite from visitor fatigue. Inside, the museum’s circulation design responded to big families by offering empty areas – what the architect called "breathing space". OK, manipulate the space… what else? Let’s dive in a bit on this one. Definitely different visitors need different experiences to walk away fulfilled. Depending on the individual’s set of circumstances, they may not require both quiet contemplative and loud high energy on the same day. Different strokes for different folks. Are we actually looking more at positioning ourselves on various engaging continuums for the head, heart and hands between high and low energy level as well as between high and low participation? For sure, we should be consciously designing for diversity of experience without trying to be all things for all people. At EID we believe diverse experiences that integrate the four elements of meaningful (head), memorable (heart), tangible (hands), and flavourful (hunger) experiences, need to be set up for visitors. At your centre, gallery, park, or museum do you feel you offer a variety of experiences that stimulate the mind, arouse the emotions, engage the body physically, and lubricate a social discussion? Here is an exercise to try at your site. List mission-based experiences that a specific visitor demographic would conceivably be involved in for a half-day. Note next to each experience if it focuses on mind, emotion, physical, or social. Ask yourself - How balanced are our experiences? Overall experience mix is important, and historically we have had an interpretive tendency to weigh heavily on the conceptual/cognitive dimension, or swing to the other extreme to weigh heavily on the emotional "WOW" stuff without the attendant substance. The Frost Science Museum had a $300 million plus budget allowing them big “gotcha” moments like an 8k high resolution immersion planetarium screen and a 30 foot-wide skylight oculus, letting visitors stand below the marine life. Is this oculus being supported by a conscious celebration of the value of special places and earth's passengers? Too often, without outcome driven interpretive vision and involvement at the design table, the building's impact lacks follow-up intent. The article did not report on what was in place to support Frost’s mission of reducing the threshold to learning and achieving an investigative curiosity in visitors. Their website states “through face-to-face encounters with working scientists and dynamic live animals, experience a connection to these rich ecological systems, and the science behind them.“ If anyone in the interpretive community has visited Miami’s new heritage institution, please weigh in on the discussion and let us know your analysis. Do you think the Frost experience meets it stated mission? If we, as interpreters, could work together with architects to craft the visitor experience, think of how powerful that might be: an integrated design team instead of a handoff and an inheritance. I am aware of this happening at the following example though I have not visited the site. 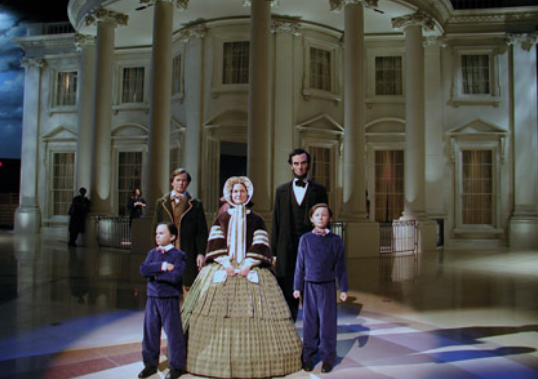 The Abraham Lincoln Presidential Museum proclaims it is the first Experience Museum of its kind. From the beginning the creation of this museum was a unique process. Instead of first designing the architecture of the building and then the contents within, the Visitor Experience was designed first by BRC Imagination Arts, under the direction of the Illinois Historic Preservation Agency. Next the building was commissioned to house the immersive “experience” exhibits that present the unique life and times of Abraham Lincoln. BRC imagination Arts bills their approach to experience design as showmanship meets scholarship - visitor fatigue be gone. On the subject of stimulating curiosity and investigation, you might want to find out more about a place that bills itself as being “designed to encourage you to indulge your curiosity and explore more than ever before." They call themselves a “destination for the incurably curious.” Employing a wide range of exhibitions, collections, live programming, digital, broadcast and publishing, they invite you to think critically and dig deeper into the connections between science, medicine, life and art. So if you were initially thinking about Ripley’s Believe It or Not attraction you would be incorrect. It is a tad more intellectual. The Wellcome Collection is a free museum and library exploring health, life and our place in the world. A centrepiece is the Reading Room described as an innovative hybrid of gallery, library and events space, with contemporary sculptures, paintings, medical artefacts and manuscripts. There are 10 different sections to the room: Alchemy, Food, Travel, Body, Breath, Face, Pain, Mind, Lives and Faith, each with its own collections of objects, fiction, non-fiction and interactive activities. They implore you to get cozy with a book on a comfy sofa, contemplate life or begin a chat with a stranger. Not quite in-depth enough for you? You are invited to engage with people through Ideas Hub, a week-long programme of activities and workshops providing a window into transdisciplinary research, exploring how different perspectives can produce new insights into what it is to be human. While this post focused on antidotes to reducing Visitor Fatigue Syndrome using the indoor museum form of a heritage site, Part 2 of this post will take you down an outdoor path perspective. Maintaining interest and engagement especially on self-guided experiences is a challenge. We will shine a light on the need to provide investigative skills to heighten curiosity, as this is a major thrust behind our work. Regardless of the specific heritage site situation you find yourself in, acquiring antidotes for nature walk fatigue, garden fatigue, historic house fatigue, etc. is an important task. Interpretive designers, educators and front line interpreters need to always be on the lookout, and ready to apply, relevant examples that different fields have to offer to your specific experience.